Ignorance of the law is not a defense of the law. But ignorance of the law can show that there was no criminal intent. It can mean the difference between being found guilty of negligence or of criminal tax evasion — charges that carry very different penalties if you are convicted. Not all of these are definitive signs of tax fraud. However, these will all send up red flags that will prompt a tax representative to take a closer look at your return or to initiate an audit. Many people make mistakes on their tax returns, especially if they file their returns themselves. These mistakes are not necessarily intentional, which means that they would likely be classified as simple negligence. Just because these mistakes were unintentional does not mean that you won’t face penalties. It just means that you won’t likely face criminal penalties, but will most likely face a 20 percent penalty. You could pay a 75 percent penalty if you are found guilty of criminal tax evasion of civil fraud. What Happens If Fraud or Negligence is Suspected? For simple errors, the IRS is likely to only send you a letter asking you to correct your return or to provide documentation showing that the error is not an error after all. However, if there are multiple or egregious errors on your return, you will likely be subject to an audit. During the audit, you may be asked to produce documentation to support all the information provided on your return, including for all your deductions and your claimed expenses. The auditor may also comb through your financial ledgers and accounts to discover evidence of unclaimed income or other deception. Depending on the extent of the discrepancies discovered by the IRS, you could go through a lengthy audit process that can include not only the tax return in question but also many previous years’ worth of tax returns. It is critical that you work with a Phoenix criminal tax lawyer and perhaps other tax professionals during this process to ensure that you protect your legal rights. If you attempt to handle the situation on your own, you could inadvertently disclose information that either incriminates you or makes it appear that you have done something wrong. Tax law is very complex, and it is easy to make a mistake or to say something that will undermine your case. 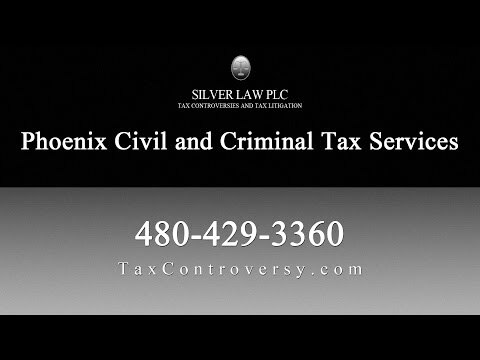 The professionals at Silver Law PLC in Arizona have been representing clients throughout the state in criminal tax litigation cases for many years. Our Phoenix criminal tax lawyers fight tirelessly for clients to minimize their criminal liability for tax evasion and fraud. We work with both corporate and individual clients, and we draw upon an extensive network of experts and resources to reduce your tax liability. We also represent clients in tax audits, collections, foreign tax issues and more. Whether you need a criminal tax lawyer or a legal ally to represent you through your routine audit, we can help you. Call us in Arizona today to schedule a free consultation with one of our tax attorneys.